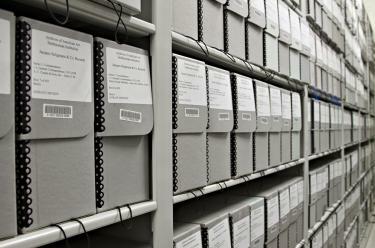 Learn about the Archives' holdings and Oral History Program. The Archives of American Art has one of the oldest and most respected oral history collections in the country. Since 1958, our Oral History Program has preserved the distinct voices and human memory of the American art world in more than 2,300 interviews. The purpose of the Archives’ Oral History Program is to create unique, lengthy exchanges between interviewers and narrators, conversations that yield a richness of detail and a sense of character not available in other primary sources. These recordings chronicle the great diversity of the American art scene, augmenting and refining our perception of individual artists, dealers, critics, and curators and their social and professional worlds. Common themes, such as artists' educational backgrounds, working methods, sources of inspiration, technical innovations, and issues of patronage emerge across artistic mediums and across generations. With seed money from the Ford Foundation, the Archives set out in 1958 to record the life stories of the artists, collectors, dealers, and others who have shaped the visual arts in the United States. At that time, there were a number of living artists whose memories stretched back to the early 20th century. The first taped interviews were with painters Abraham Walkowitz, (1878–1965), Charles Sheeler (1883–1965), and Edward Hopper (1882–1967). They not only led distinguished and influential careers, but all three had also participated in the landmark Armory Show of 1913, the first large-scale exhibition of modern art in the United States. Their spoken reminiscences and observations of this event would be of obvious benefit to present and future historians. These first three interviews point out the unpredictability of a free and open dialogue with an interviewee: Walkowitz commented on the principal organizers of the Armory show; Sheeler remembered the collectors who purchased works from the show; and Hopper's interviewer did not ask any questions about the Armory Show. While collectively these interviews contribute to a fuller understanding of the past, each is unique, giving a sense of immediacy and revealing a richness of detail and character not available in written records. In other interviews Josef Albers answered the question, "Why squares;" Ilya Bolotowsky recalled the Russian Revolution; Leo Castelli described his first American curatorial effort, the Ninth Street Show of 1951; Marcel Duchamp drew a distinction between found objects and his "readymades;" Roy Lichtenstein commented on humor as a creative catalyst; and Katharine Kuh talked about her gallery in Chicago as the lone outpost for modern art in the mid-1930s. As these examples demonstrate, the Archives’ oral history program preserves life stories and first-hand accounts that are central to the history of American art. The Archives' Oral History Program was modeled after the Columbia University Center for Oral History. Like many other programs, we have kept up with best practices in the field while attempting to produce more interviews, better, and faster, and with fewer resources. While we typically produce in-depth oral histories in multiple sessions, we have also focused interviews around particular issues or moments in art history. In 2001, we began providing access to oral history transcripts online. We are currently exploring ways to provide access to the audio online and ways to use crowdsourcing for transcription and indexing. For more information about the Oral History Program, please contact Research and Reference Services.